Flurbiprofen, a propionic acid derivative, is a nonsteroidal anti-inflammatory agent (NSAIA) with antipyretic and analgesic activity. Oral formulations of flurbiprofen may be used for the symptomatic treatment of rheumatoid arthritis, osteoarthritis and anklylosing spondylitis. 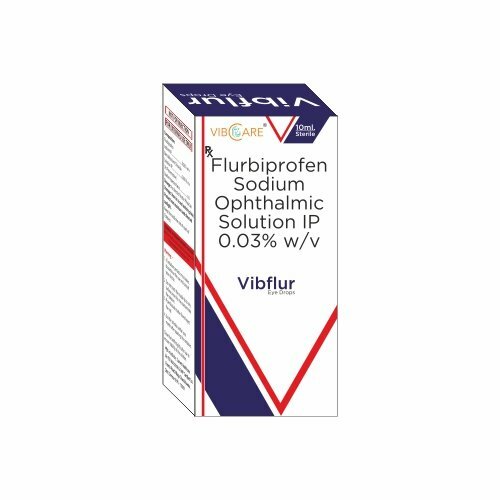 Flurbiprofen may also be used topically prior to ocular surgery to prevent or reduce intraoperative miosis. Flurbiprofen is structurally and pharmacologically related to fenoprofen, ibuprofen, and ketoprofen. “LD50=10 mg/kg (orally in dogs). Selective COX-2 inhibitors have been associated with increased risk of serious cardiovascular events (e.g. myocardial infarction, stroke) in some patients. Current data is insufficient to assess the cardiovascular risk of flurbiprofen. Flurbiprofen may increase blood pressure and/or cause fluid retention and edema. Use caution in patients with fluid retention or heart failure. Risk of GI toxicity including bleeding, ulceration and perforation. Risk of direct renal injury, including renal papillary necrosis. Anaphylactoid and serious skin reactions (e.g. exfoliative dermatitis, Stevens-Johnson syndrome, toxic epidermal necrolysis) may occur. Common adverse events include abdominal pain, constipation, diarrhea, dyspepsia, flatulence, GI bleeding, GI perforation, nausea, peptic ulcer, vomiting, renal function abnormalities, anemia, dizziness, edema, liver function test abnormalities, headache, prolonged bleeding time, pruritus, rash, tinnitus. Although rarely documented in the case of flurbiprofen, oral propionic acid derivatives have been associated with a relatively high frequency of allergic reactions. Flurbiprofen tablets are indicated for the acute or long-term symptomatic treatment of rheumatoid arthritis, osteorarthritis and anklosing spondylitis. It may also be used to treat pain associated with dysmenorrhea and mild to moderate pain accompanied by inflammation (e.g. bursitis, tendonitis, soft tissue trauma). Topical ophthalmic formulations may be used pre-operatively to prevent intraoperative miosis.